Thousands of people gathered in Sydney on Thursday to join Indigenous Australians protesting national Australia Day celebrations on 26 January. The group marched through Sydney city demanding that the date of Australia Day be changed to a more inclusive date. The rally was also to highlight and raise awareness about the high rates of Aboriginal child removals and Aboriginal deaths in custody. 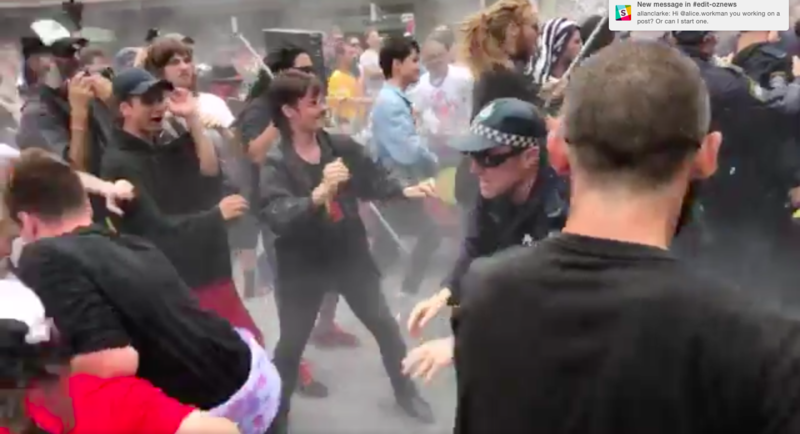 The predominantly peaceful protest turned violent at one point when several police officers tackled Birrugan Dunn-Velasco, the Indigenous lead singer of heavy metal band Dispossessed, as he tried to set light to an Australian Flag. The Sydney Invasion Day rally just turned violent. Velasco was giving a speech to the crowd about the death of Aboriginal people following colonisation when he started to pour lighter fluid on the Australian flag. "Always was always will be Aboriginal land"
Police broke through the crowd and wrestled him to the ground. Australia Day is often referred to as Survival or Invasion Day for Indigenous Australians. They’ve been calling for the date to be changed for decades. This year’s Sydney protest also saw a large number of non-Indigenous people joining the call to change the date. “It is a day of mourning for Aboriginal people. We have been mistreated, slaughtered and beaten down since the day [January 26, 1788], so don’t expect us to be happy little Aboriginals on that day,” Ken Canning, one of the rally’s organisers, told BuzzFeed News. The Sydney Invasion Day march was the largest Sydney has seen in several years and big turnouts were also seen at other rallies around the country. The largest protest took place in Melbourne, where it was estimated tens of thousands of people took part in an Invasion Day rally that shut down the CBD. Calls to move the date have gained momentum this year with several high profile social media campaigns and support from people at both ends of the political spectrum. The hashtags #ChangeTheDate, #InvasionDay and #SurvivalDay were all trending on social media. According to Twitter, the number of tweets mentioning #ChangeTheDate increased by 850% since Australia Day 2016. “I think a lot more people are talking about invasion Day this year, even people you wouldn't expect to come out and talk about it... as an Aboriginal person, that means a lot to me,” Roxanne Moore, Amnesty International’s Indigenous campaigner, told BuzzFeed News. 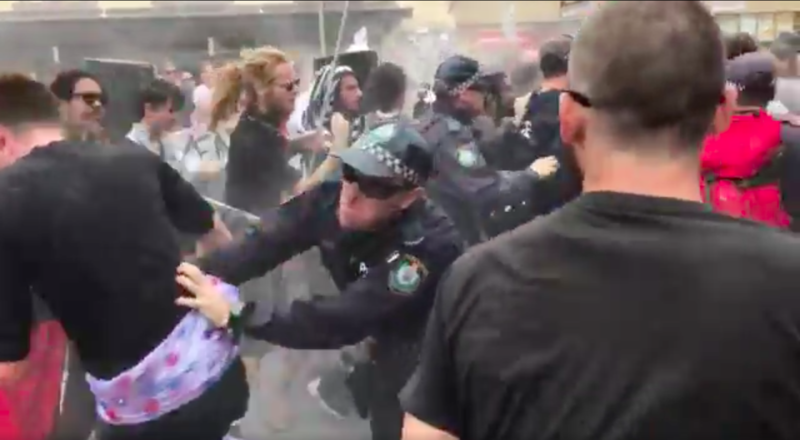 UPDATE In a statement issued after the Sydney Invasion Day rally, NSW police said a 20-year-old man was arrested and taken to Redfern police station. 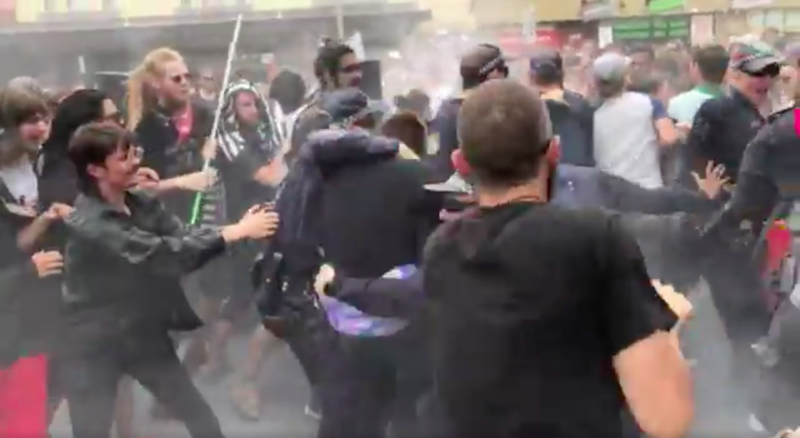 A police officer was injured in the scuffle and taken to hospital and a woman who was participating in the march also sustained minor injuries and was treated by paramedics before being taken to hospital, police said.